The latest blog post by London School of Marketing advises Business and Marketing degree students on how to expand their CVs. The post says students studying a Business and Marketing degree at LSM have a 90% chance of being hired within six months of graduation. As a student following a Business Management degree, what more can I do to expand my resume? Having a highly regarded Business and Marketing degree on your CV will instantly grab the attention of prospective employers. London School of Marketing’s latest blog post emphasises the importance of developing a clear, accurate and eye-catching CV in today’s competitive job market. Students are advised to take a pro-active approach and use their CV to prove they have the skills prospective employers are looking for. Providing free marketing to charities and starting a blog are easy ways to demonstrate key skills and interests. Anton Dominique, the school’s chief marketing officer, said: “Having a highly regarded Business and Marketing degree on your CV will instantly grab the attention of prospective employers – it shows you have current, extensive knowledge of the industry and the determination to succeed. 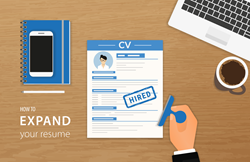 The post goes on to list a number of ways in which students can improve their CVs, such as getting work experience, backing up claims about skills with data, and including relevant keywords. The full blog post, including detailed tips on how Business and Marketing students can expand their CVs, can be viewed here. The internationally recognised courses and qualifications offered by the school, including Business and Marketing degrees, can be viewed here.